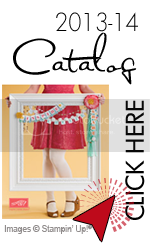 Nest week I will be leaving for Salt Lake City with Michelle and Debi, two of my downlines. 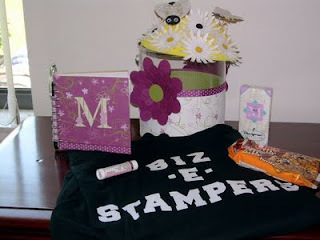 All of my downlines are one of the main reason I love Stampin'Up. All are very nice, talented women who share their talents with others. It is customary for the upline, me to make something special for my downlines who are also attending convention. Kind of a survival kit to be used at convention. Since both Debi and Michelle have theirs I can now post what I did this year. Years past, before airline weight limits on luggage they would not receive their survival kit until arrival at convention. I think that was more fun but we have to change with the times. This year, the items were in a clear paint can deorated with our new Cottage Wall paper. Inside was a , journal, matching pen, black top with Biz-e-Stampers on the back. A bright yellow visor with daisies and two elevated bees. Kleenex with their initial, cereal bars, chocolate, crystal light and lip gloss. All will be needed during the convention. Hopefully, next year more will be able to join me in Salt Lake City.